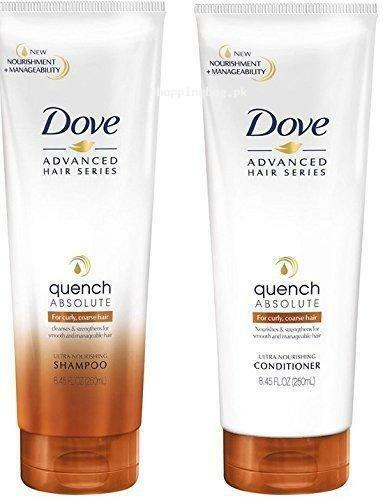 Here is the Dove Quench Absolute Ultra Nourishing Shampoo and Conditioner Set online in Pakistan that is provided to the consumers in Pakistan for Dove Quench Absolute Ultra Nourishing Shampoo and Conditioner Set online shopping in Pakistan. It is the original Dove product that is imported from Amazon in Pakistan. It is the high quality shampoo that gently cleans and nourishes the hair. It gives special shine and bounce to hair. Using thin shampoo will minimize the frizz from hair and soften the curls. The set of conditioner and shampoo is ultimate for hair nourishment. You can have original Dove Quench Absolute Ultra Nourishing Shampoo and Conditioner Set for online shopping in Pakistan. Find this imported from Amazon Dove Quench Absolute Ultra Nourishing Shampoo and Conditioner Set in best price in Pakistan and buy this for you. It deeply nourishes the hair and condition them for beautiful and healthy look. It makes the hair touchable and soft with its creamy formula. Get beautiful hair with Dove and buy Dove Quench Absolute Ultra Nourishing Shampoo and Conditioner Set online in Pakistan now. Place your order now and we will provide this product at your home with cash on delivery anywhere across Pakistan. Enjoy Dove Quench Absolute Ultra Nourishing Shampoo and Conditioner Set online shopping in Pakistan and explore our online store for more exclusive and high quality products from Amazon in Pakistan. We are providing Amazon products in best price in Pakistan and enjoy Amazon online shopping in Pakistan.